Dr. Song Woo Hur, expert on feminist politics and women’s movements in South Korea, will discuss “A Korean Feminist’s Wrestling with God: Living with Feminism and Christianity in Korea” at the April gathering of The Episcopal Asian Supper Table (EAST), at Trinity Church on Saturday, April 7 at 5:30 PM. All are welcome to attend. EAST is a growing ministry of the Episcopal Diocese of New York that celebrates the dignity of Asian and Asian-American spirituality. Our monthly events are a welcoming space to share stories, seek God, and bridge diverse cultures through spiritual reflection, prayer, music, fellowship and food. Dr. Song Woo Hur, expert on feminist politics and women’s movements in South Korea, will discuss “A Korean Feminist’s Wrestling with God: Living with Feminism and Christianity in Korea” at the April 7th gathering of The Episcopal Asian Supper Table (EAST). 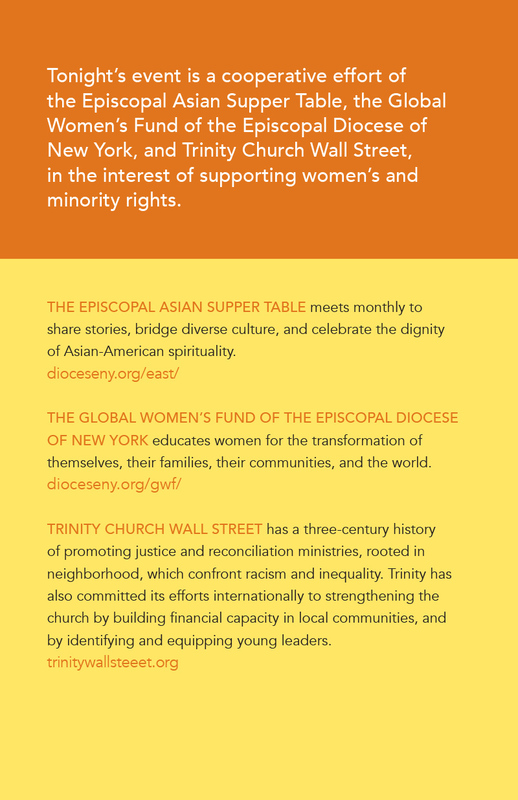 Trinity Church Wall Street is a growing and inclusive Episcopal parish that seeks to serve and heal the world by building neighborhoods that live Gospel truths, generations of faithful leaders, and sustainable communities. The parish is guided by its core values: faith, integrity, inclusiveness, compassion, social justice, and stewardship. Members come from the five boroughs of New York City and surrounding areas to form a racially, ethnically, and economically diverse congregation. More than 20 worship services are offered every week at its historic sanctuaries, Trinity Church and St. Paul’s Chapel, the cornerstones of the parish’s community life, worship, and mission, and online at trinitywallstreet.org. The parish welcomes approximately 2.5 million visitors per year.